알테어 솔리드씽킹의 Model Based Development Suite인 컴포즈(Compose), 액티베이트(Activate), 임베드(Embed)의 2017 버전이 릴리즈 되었습니다. 솔리드씽킹 컴포즈, 액티베이트, 임베드는 수학, 신호 기반, 물리적 구성 요소 및 3D 모델링 기술을 통합함으로써 모델 기반의 개발 기술을 활용합니다. 또한 다양한 사용자 커뮤니티를 통해 협업을 가능하게 합니다. 해당 제품 업데이트에 대한 자세한 내용은 릴리즈 노트를 참조하시기 바랍니다. Compose, Activate, Embed 2017 공식 업데이트의 상세한 내용은 아래와 같습니다. solidThinking Compose is a high level, matrix-based numerical computing language as well as an interactive & unified programming environment for all types of math. 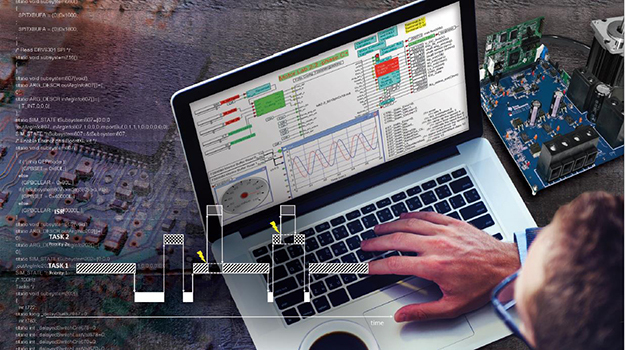 Whether you’re looking to solve matrix analysis, differential equations, perform signal analysis or robustly study control design, Compose not only offers its users with a modern, comprehensive set of tools to enable rapid development but also offers a powerful engine and an interactive debugging environment for streamlined troubleshooting. Python support • Compose 2017 support Python as a new scripting language. The Compose IDE allows for edition, execution and debugging of Python (3.4) scripts. Library Browser • Library Browser widget is added. It shows all supported functions, provides direct access to help and the commands can be drag and dropped in the editor. solidThinking Activate enables product creators, system simulation and control engineers to model, simulate and optimize multi-disciplinary systems. By leveraging model based development, ensure that all design requirements are successfully met while also identifying system level problems early in the design process. Robust handling of signal-based as well as physical models: In release 2017, the physical component modeling is improved by using a Modelica Engine powered by Maplesoft™ and a library of blocks based on Modelica Standard Library 3.2.1. The following features and enhancements have been added for solidThinking Activate 2017. License Wizard(solidThinking installer only) To improve licensing setup with solidThinking license files or server, a License Wizard utility tool is added. Palette Browser The Palette Browser is modified and reorganized to place all installed libraries at the top level for easier navigation. 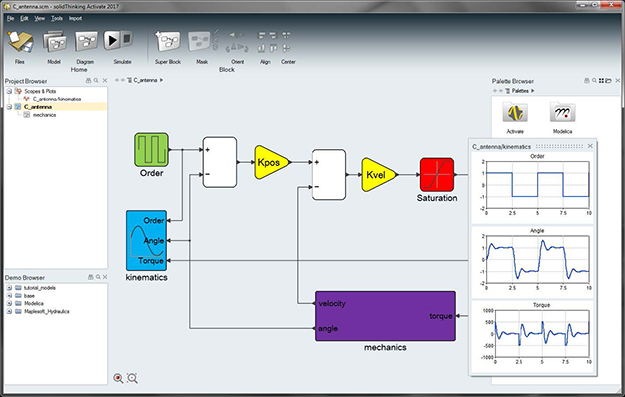 Physical Component Modeling • Activate offers Modelica support and a block library based on the Modelica Standard Library 3.2.1. This enables use of Modelica blocks in Activate model. 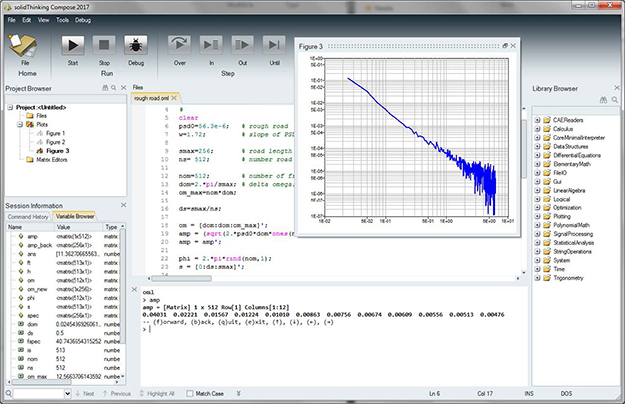 This Modelica Engine is powered by Maplesoft™. Note: A C++ compiler is required for this feature. • With Activate 2017, an option to import Modelica libraries into Activate libraries is added. Cosimulation with Altair MotionSolve • Activate handles the cosimulation with MotionSolve using IPC communication. In future releases of MotionSolve, this will allow for executing MotionSolve on remote machines. • Activate 2017 supports multiple MSPLANT blocks inside a model. This feature is in BETA mode for release 2017. Cosimulation with Altair Flux • Starting with version 12.2 of Flux, Flux exports a component to be used in Activate for Cosimulation. Activate 2017 includes a new Flux Cosimulation block. The sum block accepted / and *, and the product block accepted + and -, signs. This is no longer allowed. solidThinking Embed, formerly known as VisSim Embedded, is a block diagram language for model-based embedded development. It supports UML State Charts integrated with dataflow block diagrams. This allows you to easily simulate and generate efficient fixed- and floating-point C code for embedded microprocessor targets. It provides a complete visual RTOS with on-chip peripheral drivers, unlimited pre-emptible tasks, simple interrupt handler creation, interrupt-based serial I/O queuing, and an interface to hand code. solidThinking Embed is unique in its ability to generate highly efficient, high sample rate, low jitter target executables. Compiler: Texas Instruments Code Composer Studio version 6.x. Code Generation Tools for MSP430 support: TI-CGT version 4.4.x. Comm and Digital Power Designer add-ons Embed 2017 now supports two additional modules (separate delivery and installation, using feature-based licenses): Comm and Digital Power Designer. Diagram Efficiency Display a warning message about diagram efficiency. 이 글은 update 카테고리로 분류되었고 wonyongshim님에 의해 2017년 2월 24일 에 작성됐습니다.